Definition at line 315 of file CCopasiXMLParser.h. Definition at line 200 of file CCopasiXMLParser.cpp. 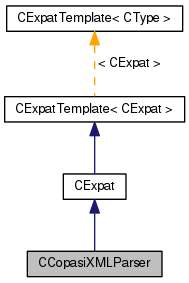 References CExpatTemplate< CExpat >::create(), CExpatTemplate< CExpat >::enableElementHandler(), mCommon, mElementHandlerStack, SCopasiXMLParserCommon::mParameterGroupLevel, SCopasiXMLParserCommon::pCompartmentGlyph, SCopasiXMLParserCommon::pCurrentLayout, SCopasiXMLParserCommon::pCurve, SCopasiXMLParserCommon::pFunction, SCopasiXMLParserCommon::pFunctionList, SCopasiXMLParserCommon::pGeneralGlyph, SCopasiXMLParserCommon::pGradient, SCopasiXMLParserCommon::pGroup, SCopasiXMLParserCommon::pGUI, SCopasiXMLParserCommon::pLayoutList, SCopasiXMLParserCommon::pLineEnding, SCopasiXMLParserCommon::pLineSegment, SCopasiXMLParserCommon::pListOfCurveElements, SCopasiXMLParserCommon::pMetaboliteGlyph, SCopasiXMLParserCommon::pMetaboliteReferenceGlyph, SCopasiXMLParserCommon::pModel, SCopasiXMLParserCommon::pPlotList, SCopasiXMLParserCommon::pReactionGlyph, SCopasiXMLParserCommon::pRenderInformation, SCopasiXMLParserCommon::pReport, SCopasiXMLParserCommon::pReportList, SCopasiXMLParserCommon::pStyle, SCopasiXMLParserCommon::pTaskList, SCopasiXMLParserCommon::pText, SCopasiXMLParserCommon::pTextGlyph, SCopasiXMLParserCommon::pVersion, and SCopasiXMLParserCommon::UnmappedKeyParameters. Definition at line 253 of file CCopasiXMLParser.cpp. 256 // allocated in the constructor. Definition at line 317 of file CCopasiXMLParser.cpp. References CExpatTemplate< CExpat >::enableCharacterDataHandler(), and mCharacterData. const std::string & join = " "
Retrieve the data. Any sequence of toBeStripped characters is replaced by a single join character. The default is no stripping. Definition at line 332 of file CCopasiXMLParser.cpp. Definition at line 392 of file CCopasiXMLParser.cpp. Definition at line 389 of file CCopasiXMLParser.cpp. Definition at line 371 of file CCopasiXMLParser.cpp. Definition at line 395 of file CCopasiXMLParser.cpp. References CCopasiContainer::getObject(), CCopasiVectorN< CType >::getObject(), CCopasiObjectName::getRemainder(), mCommon, SCopasiXMLParserCommon::pFunctionList, SCopasiXMLParserCommon::pModel, and SCopasiXMLParserCommon::pTaskList. Definition at line 380 of file CCopasiXMLParser.cpp. Definition at line 374 of file CCopasiXMLParser.cpp. Definition at line 377 of file CCopasiXMLParser.cpp. Definition at line 323 of file CCopasiXMLParser.cpp. References CCopasiXMLInterface::encode(), mCharacterData, and mCharacterDataEncoding. Definition at line 273 of file CCopasiXMLParser.cpp. Definition at line 307 of file CCopasiXMLParser.cpp. Definition at line 266 of file CCopasiXMLParser.cpp. Pop the element handler form the stack. Definition at line 365 of file CCopasiXMLParser.cpp. Push the element handler on the stack. Definition at line 362 of file CCopasiXMLParser.cpp. Definition at line 10977 of file CCopasiXMLParser.cpp. Definition at line 368 of file CCopasiXMLParser.cpp. Definition at line 383 of file CCopasiXMLParser.cpp. Definition at line 386 of file CCopasiXMLParser.cpp. Definition at line 327 of file CCopasiXMLParser.h. Referenced by enableCharacterDataHandler(), getCharacterData(), onCharacterData(), and onSkippedEntityHandler(). Definition at line 491 of file CCopasiXMLParser.h. Definition at line 332 of file CCopasiXMLParser.h. Definition at line 1795 of file CCopasiXMLParser.h. Attributes accessible through the whole parser. Definition at line 322 of file CCopasiXMLParser.h. 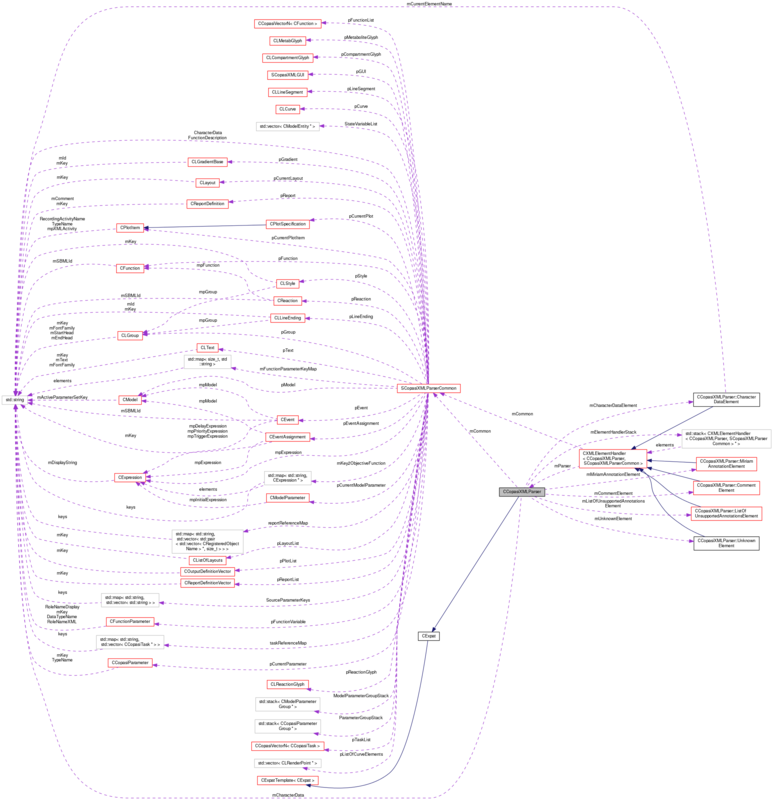 Referenced by CCopasiXMLParser(), CCopasiXMLParser::ModelParameterElement::end(), CCopasiXMLParser::ModelParameterGroupElement::end(), CCopasiXMLParser::ModelParameterSetElement::end(), CCopasiXMLParser::ListOfModelParameterSetsElement::end(), CCopasiXMLParser::CharacterDataElement::end(), CCopasiXMLParser::InitialStateElement::end(), CCopasiXMLParser::KineticLawElement::end(), CCopasiXMLParser::ReactionElement::end(), CCopasiXMLParser::MetaboliteElement::end(), CCopasiXMLParser::CompartmentElement::end(), CCopasiXMLParser::ModelValueElement::end(), CCopasiXMLParser::EventElement::end(), CCopasiXMLParser::AssignmentElement::end(), CCopasiXMLParser::CommentElement::end(), CCopasiXMLParser::ModelElement::end(), CCopasiXMLParser::PlotItemElement::end(), CCopasiXMLParser::ListOfChannelsElement::end(), CCopasiXMLParser::ListOfPlotItemsElement::end(), CCopasiXMLParser::PlotSpecificationElement::end(), CCopasiXMLParser::ListOfPlotsElement::end(), CCopasiXMLParser::ListOfTasksElement::end(), CCopasiXMLParser::ParameterTextElement::end(), CCopasiXMLParser::ParameterGroupElement::end(), CCopasiXMLParser::TaskElement::end(), CCopasiXMLParser::ListOfReportsElement::end(), CCopasiXMLParser::HeaderElement::end(), CCopasiXMLParser::BodyElement::end(), CCopasiXMLParser::FooterElement::end(), CCopasiXMLParser::TableElement::end(), CCopasiXMLParser::ReportElement::end(), CCopasiXMLParser::COPASIElement::end(), CCopasiXMLParser::ListOfFunctionsElement::end(), CCopasiXMLParser::ListOfParameterDescriptionsElement::end(), CCopasiXMLParser::FunctionElement::end(), CCopasiXMLParser::MiriamAnnotationElement::end(), CCopasiXMLParser::CurveElement::end(), CCopasiXMLParser::ListOfLayoutsElement::end(), CCopasiXMLParser::LinearGradientElement::end(), CCopasiXMLParser::RadialGradientElement::end(), CCopasiXMLParser::LineEndingElement::end(), CCopasiXMLParser::TextElement::end(), CCopasiXMLParser::RenderCurveElement::end(), CCopasiXMLParser::PolygonElement::end(), CCopasiXMLParser::LocalStyleElement::end(), CCopasiXMLParser::GlobalStyleElement::end(), CCopasiXMLParser::LocalRenderInformationElement::end(), CCopasiXMLParser::GlobalRenderInformationElement::end(), CCopasiXMLParser::GroupElement::end(), getCurrentGroup(), getLayoutList(), getModel(), getObjectFromName(), getPlotList(), getReportList(), getTaskList(), setDatamodel(), CCopasiXMLParser::ParameterGroupElement::setDerivedElement(), setFunctionList(), setGUI(), setLayoutList(), CCopasiXMLParser::ModelParameterElement::start(), CCopasiXMLParser::ModelParameterGroupElement::start(), CCopasiXMLParser::ListOfUnsupportedAnnotationsElement::start(), CCopasiXMLParser::ModelParameterSetElement::start(), CCopasiXMLParser::ListOfModelParameterSetsElement::start(), CCopasiXMLParser::StateTemplateVariableElement::start(), CCopasiXMLParser::StateTemplateElement::start(), CCopasiXMLParser::SourceParameterElement::start(), CCopasiXMLParser::CallParameterElement::start(), CCopasiXMLParser::ListOfCallParametersElement::start(), CCopasiXMLParser::KineticLawElement::start(), CCopasiXMLParser::ConstantElement::start(), CCopasiXMLParser::ListOfConstantsElement::start(), CCopasiXMLParser::ModifierElement::start(), CCopasiXMLParser::ListOfModifiersElement::start(), CCopasiXMLParser::ProductElement::start(), CCopasiXMLParser::ListOfProductsElement::start(), CCopasiXMLParser::SubstrateElement::start(), CCopasiXMLParser::ListOfSubstratesElement::start(), CCopasiXMLParser::ReactionElement::start(), CCopasiXMLParser::ListOfReactionsElement::start(), CCopasiXMLParser::MetaboliteElement::start(), CCopasiXMLParser::ListOfMetabolitesElement::start(), CCopasiXMLParser::CompartmentElement::start(), CCopasiXMLParser::ListOfCompartmentsElement::start(), CCopasiXMLParser::ModelValueElement::start(), CCopasiXMLParser::ListOfModelValuesElement::start(), CCopasiXMLParser::ListOfAssignmentsElement::start(), CCopasiXMLParser::EventElement::start(), CCopasiXMLParser::ListOfEventsElement::start(), CCopasiXMLParser::AssignmentElement::start(), CCopasiXMLParser::ModelElement::start(), CCopasiXMLParser::ChannelSpecElement::start(), CCopasiXMLParser::PlotItemElement::start(), CCopasiXMLParser::ListOfChannelsElement::start(), CCopasiXMLParser::ListOfPlotItemsElement::start(), CCopasiXMLParser::PlotSpecificationElement::start(), CCopasiXMLParser::ListOfPlotsElement::start(), CCopasiXMLParser::ListOfTasksElement::start(), CCopasiXMLParser::ReportInstanceElement::start(), CCopasiXMLParser::ParameterElement::start(), CCopasiXMLParser::ParameterTextElement::start(), CCopasiXMLParser::ParameterGroupElement::start(), CCopasiXMLParser::MethodElement::start(), CCopasiXMLParser::TaskElement::start(), CCopasiXMLParser::ListOfReportsElement::start(), CCopasiXMLParser::ObjectElement::start(), CCopasiXMLParser::HeaderElement::start(), CCopasiXMLParser::BodyElement::start(), CCopasiXMLParser::FooterElement::start(), CCopasiXMLParser::TableElement::start(), CCopasiXMLParser::ReportElement::start(), CCopasiXMLParser::COPASIElement::start(), CCopasiXMLParser::ListOfFunctionsElement::start(), CCopasiXMLParser::MathMLElement::start(), CCopasiXMLParser::ParameterDescriptionElement::start(), CCopasiXMLParser::ListOfParameterDescriptionsElement::start(), CCopasiXMLParser::FunctionElement::start(), CCopasiXMLParser::GUIElement::start(), CCopasiXMLParser::ListOfSlidersElement::start(), CCopasiXMLParser::SliderElement::start(), CCopasiXMLParser::CurveElement::start(), CCopasiXMLParser::CompartmentGlyphElement::start(), CCopasiXMLParser::ListOfCompartmentGlyphsElement::start(), CCopasiXMLParser::MetaboliteGlyphElement::start(), CCopasiXMLParser::ListOfMetabGlyphsElement::start(), CCopasiXMLParser::MetaboliteReferenceGlyphElement::start(), CCopasiXMLParser::ListOfMetaboliteReferenceGlyphsElement::start(), CCopasiXMLParser::ReactionGlyphElement::start(), CCopasiXMLParser::ListOfReactionGlyphsElement::start(), CCopasiXMLParser::TextGlyphElement::start(), CCopasiXMLParser::ListOfTextGlyphsElement::start(), CCopasiXMLParser::AdditionalGOElement::start(), CCopasiXMLParser::ListOfAdditionalGOsElement::start(), CCopasiXMLParser::LayoutElement::start(), CCopasiXMLParser::ListOfLayoutsElement::start(), CCopasiXMLParser::SBMLReferenceElement::start(), CCopasiXMLParser::SBMLMapElement::start(), CCopasiXMLParser::GradientStopElement::start(), CCopasiXMLParser::LinearGradientElement::start(), CCopasiXMLParser::RadialGradientElement::start(), CCopasiXMLParser::ColorDefinitionElement::start(), CCopasiXMLParser::ListOfColorDefinitionsElement::start(), CCopasiXMLParser::ListOfGradientDefinitionsElement::start(), CCopasiXMLParser::ListOfLineEndingsElement::start(), CCopasiXMLParser::LineEndingElement::start(), CCopasiXMLParser::ImageElement::start(), CCopasiXMLParser::RectangleElement::start(), CCopasiXMLParser::EllipseElement::start(), CCopasiXMLParser::TextElement::start(), CCopasiXMLParser::RenderCurveElement::start(), CCopasiXMLParser::PolygonElement::start(), CCopasiXMLParser::ListOfCurveElementsElement::start(), CCopasiXMLParser::CurveElementElement::start(), CCopasiXMLParser::LocalStyleElement::start(), CCopasiXMLParser::GlobalStyleElement::start(), CCopasiXMLParser::ListOfLocalStylesElement::start(), CCopasiXMLParser::ListOfGlobalStylesElement::start(), CCopasiXMLParser::ListOfLocalRenderInformationElement::start(), CCopasiXMLParser::ListOfGlobalRenderInformationElement::start(), CCopasiXMLParser::LocalRenderInformationElement::start(), CCopasiXMLParser::GlobalRenderInformationElement::start(), CCopasiXMLParser::GroupElement::start(), and CCopasiXMLParser::BoundingBoxElement::start(). Definition at line 337 of file CCopasiXMLParser.h. Referenced by CCopasiXMLParser(), onEndElement(), onStartElement(), popElementHandler(), pushElementHandler(), and ~CCopasiXMLParser(). Definition at line 495 of file CCopasiXMLParser.h. Definition at line 3159 of file CCopasiXMLParser.h. Definition at line 440 of file CCopasiXMLParser.h.